The first 12 young swimmers to make the Jetstar Super Swim Squad have been named, following the completion of the first two qualifying swims. 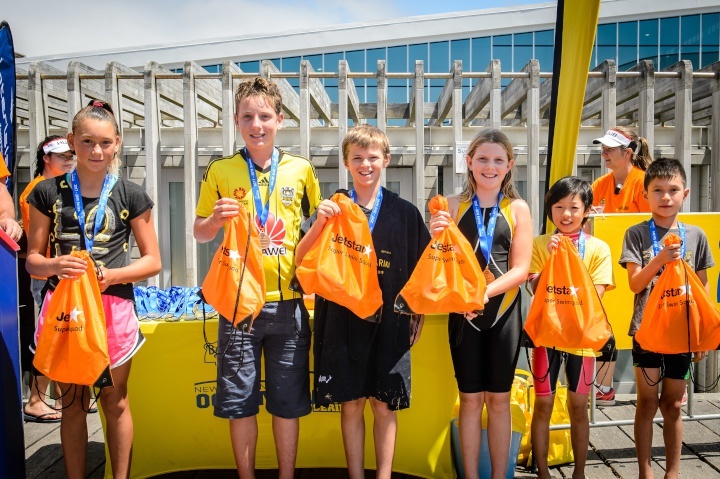 Six youngsters qualified at the Banana Boat New Zealand Ocean Swim Series in Wellington, on Sunday. by winning their age groups. They were: Talitha McEwan, (Tauranga) aged 12; Art Woodley-Hanan (12) from Paraparaumu; Noah Ireland-Spicer (10) from Paraparaumu; Marina Nadilo (9), from Lower Hutt; Judy Yang (8) from Lower Hutt and Charlie Dickison (7) from Wellington. The swim was the second of six qualifying events in the seven swim Banana Boat New Zealand Ocean Swim Series. The six have secured themselves a place in the Jetstar Super Swim Camp in Auckland on April 27 – 29. For Talitha, her win created a family affair as her younger brother Ryleigh McEwan also won a place in the Jetstar Super Swim Squad’s first qualifying event. This will the fourth time Talitha has made the camp, and the first for Ryleigh. Talitha’s mother, Veronika McEwan, said of her daughter’s swim; “When Talitha saw the lineup of the very strong, fast swimmers, she didn’t think she would win. Many of the girls in her age group are very strong pool swimmers and she felt the pressure. So, we were delighted to hear she had won. It is awesome to see companies like Jetstar get behind and support young swimmers. 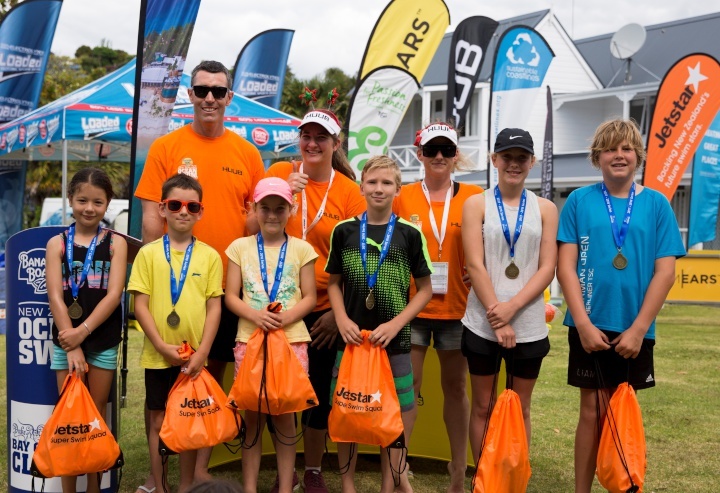 The qualifiers from the first event were in the Bay of Islands last December were: Ella Crow, 12, from Auckland; Liam Shanahan 12, from Tauranga; Grace Crow, 9, from Auckland; Judd Brown 10, from Auckland; Kaia Derbyshire, 8 from Kerikeri and Ryleigh McEwan, 8 from Tauranga. Sisters Ella and Grace Crowe will also compete together. They were thrilled to be able to compete in the event together and both win places in the Squad. The win was particularly special for Ella with it being one of her last chances to qualify for the Squad for a fourth time- before she turns 13 in February. Grace is also making her return to the Squad for a second time, having qualified for a place last year. For Liam Shanahan, this was a particularly special win as it was one of his last chances to qualify for a place in the Squad before he turns 13 in February. He has qualified for a place in the Squad every year since it began and this will be his sixth time attending the Camp. Liam also underwent major arm surgery earlier this year and made it his goal to be fit enough to swim at the event and qualify a place in the Squad for a final time. The Banana Boat New Zealand Ocean Swim Series runs from November 2017 to April 2018. The 2018 Jetstar Super Swim Squad Camp will take place in Auckland on 27th – 29th April. The next opportunity for young swimmers to win a place in the squad will be at the upcoming swim in the Donelley Sawmillers Legend of the Lake Swim in Rotorua on February 17. Image caption 1 Wellington winners: From left; Talitha McEwan, Art Woodley-Hanan, Noah Ireland-Spicer, Marina Nadilo, Judy Yang, Charlie Dickison. Image caption 2: Bay of Island winners: From left; Kaia Derbyshire, Ryleigh McEwan, Grace Crowe, Judd Brown, Ella Crowe and Liam Shanahan.